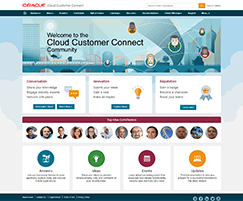 We are pleased to announce that effective immediately, Oracle Cloud Platform (PaaS) and Oracle Cloud Infrastructure (IaaS) forums are migrating to Oracle Cloud Customer Connect. The community has expanded to include 22 exciting new forums covering various PaaS and IaaS topics. We invite you to share, collaborate and contribute as you delve into the new forums and connect with colleagues and Oracle experts in your areas of interest. Register today to ask questions, connect with experts, and share your thoughts and ideas about Oracle Cloud Platform services.